Augusta is a 50th anniversary project of Historic Augusta, Inc. written by Dr. James W. Garvey and Dr. Lee Ann Caldwell, with photography by James R. Lockhart. 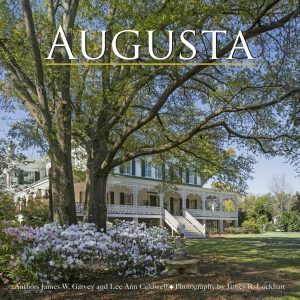 Richly illustrated with archival images and current views professionally photographed, this beautiful book provides an overview of Augusta’s history through its architecture from the eighteenth to the late twentieth centuries. Books are available for purchase at Historic Augusta’s office, located at 415 Seventh Street, or at Shoes At Surrey. Can’t make it downtown? Click the link below and purchase your copy via our SquareStore. Books may be shipped for an extra $10 shipping and handling fee. All proceeds support Historic Augusta’s mission to preserve architecturally significant sites and structures in Augusta and Richmond County, Georgia. It will make a lovely gift! Please click here to order the book.